Anthony Pierozzi, born on March 1, 1389, was soon nicknamed “Antoninus” (“Little Anthony”), either because of his small stature or his weak health. Thus began the life of the future Saint Antoninus born to noble parents in Florence, Italy. The influence of the Dominicans on Antoninus’ early life led him to seek admittance to the Dominican Order at the age of 15. 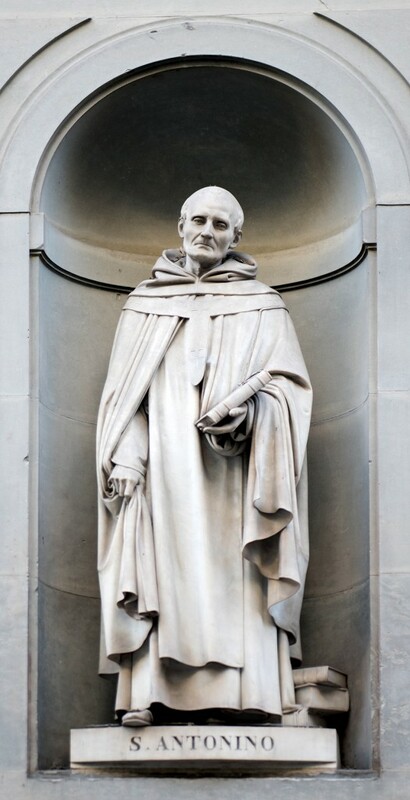 Antoninus approached the prior of the convent in Fiesole, Brother John Dominic, with his request to be admitted to the Order. Perhaps noticing the weak health of the aspirant and not wishing to give an outright refusal to Antoninus’ request, Brother John Dominic told him to come back once he had memorized the Decretum of Gratian, or the Code of Canon Law at the time. To the prior’s surprise, the youth returned within the year having accomplished the task required of him. He was thus admitted to the Order. The love and zeal he had as a novice never left Antoninus. He became a great reformer more by example than by word. Elected prior at a young age, Antoninus served as superior for many years. He, like his brother in St. Dominic, St. Thomas Aquinas, was concerned with the formation of the friars of the Order of Preachers. Hence he prepared the Summa Moralis, a systematic and comprehensive presentation of Christian Moral Theology, which he wrote, as he said, during the summer and the winter of his life. Antoninus’ writings treated the practical aspects of living the faith. Antoninus’ devotion to the Sacrament of Reconciliation and spiritual counsel earned him the title of Antoninus the Counselor. Such was his ability to instruct and to guide others. Antoninus accepted into the Order Brother John of Fiesole, the future artist, Fra Angelico. Having an eye for recognizing the gifts of others, Antoninus instructed Fra Angelico to prepare his own Summa Moralis, not in words but through his painting. Hence when the new convent of San Marco was built, Prior Antoninus had Fra Angelico grace each of the friar’s cells with a painting based on a scene from the life of Christ. After he was appointed Archbishop of Florence, Antoninus’ residence became known as the hostel for the poor, such was his generosity and service for victims of poverty. His sensitivity to the needs of others led him to found the “Men of St. Martin,” in order to offer quiet support to the wealthy who had become indigent. Hence, the Archbishop lived out the works of mercy. St. Antoninus died May 2, 1459. His funeral Mass was celebrated by Pope Pius II. He was canonized on Trinity Sunday, May 31, 1523. Eternal God, you blessed Saint Antoninus with a marvelous gift of counsel. By the help of his prayers, while we walk in the darkness of this life, may we learn from the light of Christ all that we ought to do. We ask this through our Lord Jesus Christ, your Son, who lives and reigns with you and the Holy Spirit, one God, for ever and ever. Amen.